Don't hire me to build a bridge! That's what I've learned after playing many games of X Construction on my Android phone over the past 24 hours. This game is quite cool and adds another very satisfying entry to the world of physics based puzzlers. In X Construction you play the role of a bridge builder having to carefully place girders to create a structure strong enough to allow a train to cross. On each level the span may be wider and there may be additional supports at the bottom of the chasm, but the idea remains the same. One interesting thing is that each girder that you can place can be of varying length and you drag your finger to make in longer (up to a point) or shorter so that it connects two endpoints. That created a temptation in me to always use ‘more’ or longer girders given that I didn’t have to pay for the extra steel. The game has a basic tutorial that gets you started with the only real suggestion that might help improve your game play being the somewhat obvious 'build stable shapes like triangles'. So, off I went to build my first bridge. The first bridge is pretty easy... a small gap with enough girders to make it easy. I ended up creating what looked more like a suspension bridge. As the game progressed I learned that probably wasn't the best way to go about things and that underside support worked better. When building a bridge there are two 'modes': ‘add a girder’ and ‘delete a girder’. There's also an undo option that you will use a lot. And that is probably my biggest aggravation with this game: I'm always having to undo stuff because the dots I have to touch are so small and my hand covers where I'm placing so it often takes many tries to get the placement I actually want. There's also a zoom in option that makes placement a bit better, but certainly doesn't eliminate this problem. Once you're satisfied that your bridge will hold you press the 'play' button in the upper left and watch the action as the train comes. As the train rides over the buckling behemoth you'll see some girders glow red to indicate stress. If there's too much stress the girder snaps and the train tumbles to the bottom of the abyss with the passengers doing a cheesy 'aargh' scream of death. It becomes obvious this isn't a big budget game with the audio and, from the way the train bounces around, I also start to question the physics of the game as, unless the train is made from super balls then there's no way it would actually move like that. But the bridge physics seem pretty good (although I'm certainly no expert). Eventually (hopefully?) you'll get it right and be on to the next level of which there are 11. I'm on 7 right now and while 11 levels certainly warrant the hefty $1.30ish price tag (yes, sarcasm) I have to confess that it will be sad when the game is over and I'm forced to wait for more. There's also a free version with ads available which means there's little reason not to try this game on for size. If you like physics puzzle game that this is unquestionably a necessity for your Android game library. And if you don't, it's still worth taking for a spin. I hope the game grows. There are some interesting suggestions in the game's comments on the market such as adding different vehicles (how about having a tank cross the bridge?). This is a really nice game that barely misses the 5/5 mark. 4.5/5 stars. 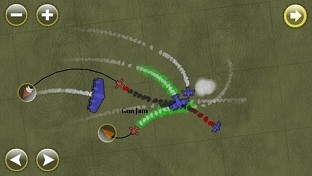 In the realms of turn based board and miniature gaming there are lots of air combat type games such as AeroDrome or Wings of War. These games can either pit you against an opposing plane or be team based. A turn typically consists of evaluating where the enemy is, predicting where your enemy will go, and then 'programming' your plane for the next turn so as to outmaneuver and eventually shoot down the opposition. SteamBirds takes this turn based battle and converts it into an Android game. SteamBirds features a nice tutorial system to get you started. It explains that the game is turn based and shows how to turn and speed up your plane. It provide the typical confidence builder mission where you start on your enemy's tail and pretty much just have to breath to get past the level (and that's the way it's supposed to be). I really like it when games have an active tutorial system instead of expecting me to passively read pages of text. As you play through missions racking up 4 star achievements and new rankings eventually you'll get to a level in which the game becomes challenging. No longer do you start in the cat bird seat, but instead you enter the scenario facing the opposition head to head in a level that features 2 planes vs. 2 planes. I tried to outmaneuver and get into a flanking position. I really didn't want to play chicken and hope that more of my shells reached their target than their based on simple luck so I twisted around. One successfully followed me and did some damage, but not enough for the kill. My other plane made it around. Now it was my turn and I easily pumped a plane full of enough lead to send it spinning down to earth. Now I had the two on one advantage and could more easily ensure a flanking position. Victory was indeed mine, but only a 2 star victory. SteamBirds adds some interesting variety as you progress. For example, soon after the above encounter there were planes that had poison gas. They would spew out a noxious, green trail of the stuff and my pilot would take damage when flying through it and my guns would jam. The game offers a nice progression to keep it fresh. SteamBirds does its job very well. I really don't have much in the way or criticism for this game. The only thing I can think of is that the bubbles I had to click on for movement are a little small on my 3.7" screen and thus it took 2-3 touches at times to connect and be able to enter my orders. This can really become aggravation when you are trying to make that perfect, precision move. SteamBirds isn't going to be for everyone. If the idea of taking turns and seeing your orders (and your opponent's orders) resolve piecemeal doesn't sound like it has enough arcade action for you then you are probably right. If the idea of a plane combat game that involves some thinking is right up your alley then you'll be in seventh heaven with this game. This game is more of a tactical game and, personally, I love it! 4.5/5 stars. I've been letting my inbox fill with informative releases of new Android games and while a press release doesn't necessarily guarantee a great game it does probably improve the odds. Army & Maiden S1F - "Army & Maiden" is a real time war simulation game. One game is a very short time. You can clear a stage in about 1-5 minutes. This is free. Phone Bomber - It’s an Android app that lets users place virtual bombs in the real world, blow each other up, etc. It’s a massively-multiplayer, location-aware game. Blox - Try as fast as possible to clean up the playfield, earn bonus time with speed combinations and discover all special items. Editor: Looks another falling blocks puzzler to me at first glance. Leap Sheep - A cute action game that kids can easily play, but is still challenging for more experienced gamers. Editor: Wish there was a bit more detail as to what one is actually doing in the game in the press release. Chess Free - A chess game from AI Factory (makers of Move It!). TileRacer - The goal of TileRacer is to connect the two yellow jellies on the border with a yellow path. You move tiles around by sliding them into the empty space. It's like those little tile puzzles taken to a whole new level. Tap Crazy - A frantic game of tapping insanity. Good guys roll down. Bad guys roll up. Kill the bad guys. Who's What - And from Ward Batty (who probably has no clue who I am, but I know who he is from my DragonCon days) and James Cobb (maker of the awesome Roll or Don't clone of Can't Stop!) we have a new game up where you see two celebrities and have to know (or guess) which is taller or heavier or older. I believe folks will find it strangely compelling. Editor: Oh, and strangely free. In SkyBoards Puzzle there's a guy that is trying to walk through the puzzle playfield to get to the end. The puzzle playfield is a grid of square pieces that can be rotated by tapping on them. Each square consists of entry and exit points along the sides. If this sounds like those plumbing games where you have to rotate the pipe pieces to get the water through the pipes and to the exit then you get a gold star as that's basically what this is. Now, the game does add a few elements to make it a bit different and, perhaps, a bit harder. First, there are rules such as when entering a square the player will always go straight, but if that can't happen and it's a choice between left and right then left it is! Second, the game adds items that have to be collected along the way adding multiple destinations to your quest for escape. SkyBoards Puzzle's graphics are pretty good. The character that walks through the maze is a bit on the small size, but big enough to see... barely. I played the demo version so while I can't comment on other stages I can say that the color palette for the first stage makes it somewhat hard to tell what's road and what's not. I'd find myself often making errors simply because of vision errors and that's just not good for this kind of game. Sound is good and the touch screen controls work well as you simply touch a square to rotate it. One other note is that I really wish I could have a little time to analyze a puzzle before playing. Once you start a level you get a handful of seconds before your player starts moving and there really isn't any time to think very far ahead. That left me feeling more frustrated than outmatched. SkyBoards Puzzle actually does a good job of representing it's genre in the Android Market, but why do we constantly have to read cliché marketing words like 'innovative' when this isn't innovative at all? I'd be more sold on a game that described itself as like a 'plumbing game on steroids'. On second thought, I guess the old 'steriods' quote is cliché, too. In any event, you know what I mean. The demo version gives you access to just one of the game's six sets of puzzles with each set consisting of ten puzzles. For $.99 that's a pretty good deal and it's a shame that they've sold fewer than 50 copies so far. If you like the plumbing puzzle games or just puzzle games in general then this is worth checking out. The QR code is for the Lite (aka free) version. I find myself giving out an awful lot of 4/5's out lately. Recent plays have yielded nothing that hits the great mark (and I avoid spending time reviewing the junk). And this one is another 4/5. I was introduced to computers on an Apple II back in the 6th grade. Consequently, the first computer game (not video game) I ever played was Lemonade Stand on this same platform. It was different from any of the arcade or computer games I had played as it didn't involve reflexes, but rather used the brain instead. On every turn I had to choose how much sugar and lemons and such to buy based on the weather. Ok, I'm not exactly sure anymore how deep that game was as my recent memories are of the graphically enhanced version of the game available on many mobile platforms. So, enter the critically acclaimed Game Dev Story. Instead of running a simple lemonade stand we are now running a software development company that makes games like Lemonade Stand. In this game you hire employees based on their talents and salary requirements, you choose what platforms to develop games for based on their market share, and you pick what kinds of games to develop as well as what to focus on (quality or quantity, for example) during development. You start off with some funding and away you go building your company. You won't have enough money early on to develop the next StarCraft, but hopefully you can create something that makes a bit of money and then you can build on that. And while I'm at it, let's be clear... this game has nothing, zero, nada to do with creating video games. It's entirely a business simulation. Game Dev Story relies entirely on a touch screen interface and on screen menus. 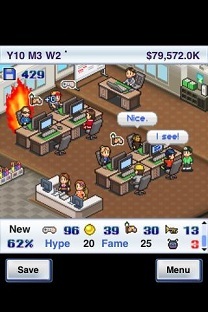 Graphically the game looks like a sim game with little guys walking around, sitting at their desks, and even making the occasional breakthrough at which time they become 'on fire'. As you develop your game a meter is shown progressing from 0 to 100% and your game will gain values in four categories (fun, graphics, sound, and creativity) as it is developed. Your game will also inherit bugs during the development process after which you'll be able to either ship it or invest a bit more time cleaning the game up. The game has a nice, catchy musical score that plays in the background along with the various bells and whistles needed to alert you when something important happens. If you think you're going to make a fortune writing video games please think again. It's like acting... only a handful of talented and, dare I say, lucky individuals will do that. Most will make less than their business counterparts that write boring software for the insurance industry. Plus, writing games for a living will likely remove that from your hobbies list. If you're truly passionate about game writing and are willing to take the salary cut from doing something everyone else wants to do and some will do for free then go for it. Just be aware of reality. Conclusion, Game Dev Story is a solid business simulator that will provide some entertainment as well. It might not even be a bad educational tool to help budding game developers understand that you can't just make an Xbox 360 game without getting a license (unless you go XNA, but that's not part of this game). I'm also a bit disappointed with all of the lavish praise poured out upon this title that there's no App2SD so it takes up a lot of space and it doesn't even seem to use my entire screen for the game's display almost as if it's a port from something else prior to the iPhone. 4/5 stars for a game that's good, but not great. Casino Crime brings the whole SimCity concept to your mobster run casino. The game starts off with you being given a little bit of cash and the job of operating a casino, and, in return, you'll be shipping a portion of your profits back home. I guess it's kind of like running a franchise for a major corporation. You start off in a small room with a lucky table and the game assigns you tasks to help you get started. In fact, the built in help (which can be disabled) is excellent and made for a smooth experience when playing for a first time. Your first task... buy a plant. Now, I'm sure that matches up with reality, but I guess you've got to start somewhere. What better way to make your customers feel welcome that with a big fern in the middle of the room? So you do that and it's time to buy another plant and then a second lucky table and all throughout it's actually trying to teach you about the number in the upper right of the screen which is kind of a customer satisfaction level. The graphics are decent in the game, but the squares on the isometric display are a little on the small side making the placement of objects error prone. The game does a good job of always having you confirm or cancel any action to eliminate the error factor, but it can still be a nuisance having to try three times to get it just right. Audio is fine with a little music playing in the background during game play and appropriate 'ching' noises when you do things. 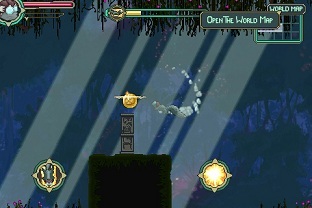 The controls are 100% touch screen based with choosing menu items or targeting the screen for various actions. As you progress the game teaches you how to pick pocket customers to boost profits (that's just a part of the crime in Casino Crime) and you'll soon be setting up various casino games before you know it. You'll then be able to adjust payouts to make your casino looser to attract business in the early stages or tighter when your focus is on the big bucks. SimCity for a mobster run casino is pretty much a perfect description of this game if I do say so myself. Personally, I think these games also satisfy the "what if I was a criminal?" question we have as we try to lead upright lives. It's actually a bit of a rush to, for example, pick pocket that first customer even though it's just a game. Does building a casino sound fun? Do you enjoy sim games? If so then this is a must get and that's not hard to do when there's a free, ad driven version available. 4.5/5 stars. Phoenix Spirit was announced and released a few weeks ago and has been in my review queue since that time. This is a game that, for a start, needs a bit more direction upon startup. I'll be the first to accept that I'm not the quickest when it comes to video games. I often miss the quick pop up boxes that provide direction the first time through. That said, perhaps such games should require acknowledgement if such guidance is important. Consequently, it took me awhile to get going with Phoenix Spirit. In this game you start off as Spirit, a character that looks like a flying squirrel with goggles, asleep only to be awoken by Phoenix to learn that your friends and the Mother Tree are diseased. Furthermore, you're the only one that hasn't been afflicted... yet. It's the "last man alive on earth" scenario. The music, however, is simply enchanting. I just enjoyed listening to the game's soundtrack for a few before jumping in. The game is controlled by tilt or touch although I stuck with tilt for the review. The controls aren't the best in this game and I found the on screen stick to be difficult to work with despite the fact that tilt control wasn't exactly easy to handle. Because this is a lengthy, goal based game and I'm fidgety I would move around and constantly have to recalibrate based on my new position. Fortunately the recalibrate option is bottom, center on the screen and it's quick and painless to do so. Next, it took me a bit to notice that the yellow dot is the direction of my tilt as the game initially indicates that it's the Phoenix character that woke me up to provide initial guidance. Once I got that down coupled with the fact that diving three successive times builds up enough speed to really get moving I was on my way and able to explore. When exploring the game feels much more like I'm swimming versus flying. Minutes later I was stuck again having seemingly explored the entire area and not gotten any further direction. I then noticed the map in the upper right of the screen that reveals areas explored and not explored. Further exploration yielded my first find and that would allow me to cure a disease. Along the way there's these things that look like plants. Touching them is bad as they are afflicted with this rampant infection. Stay away! Fortunately my newly acquired item let's me spray them with a cure... just two puffs seems to do. Once cured these plants heal and some hearts or something floats my way. What do they do? I don't know yet. And I'm stuck again. Examining the map then revealed different types of things present in the area via the map's key. The writing on it is really, really tiny though so don't try and play with anything less than 20/20 vision. There's a wind tunnel in there that I can't seem to enter as the winds are too powerful. Believe me... I tried and probably spent too much time on it. There's also a diseased tree that my little disease curing token lets me cure and it was onward from there. So what is this? I read somewhere that it's a Sonic for Android. No it's not. For a start the high paced action that Sonic offered is not here. This is more of an action / exploration type game. The developers claim it's a Metroid/Castlevania kind of game. That's probably a bit more accurate. There are mysteries to uncover along the way and while the game itself is dark (with regard to colors) it is still quite beautiful. My other issue with the game's graphics are that some elements are too small such as some of the text prompts and your character. The above represents my first 20-30 minutes of play and I was about 10% through the game so at my pace this is probably a 5-6 hour game. At a little over $2 this game is certainly worth it and it is enjoyable. If you like arcade games with a trifle of adventure and exploration thrown in then this is for you. 4/5 stars.